Research and advisory firm Technavio forecasts the global trampoline market will see compound annual growth of nearly 5 percent through 2021. That signals a lot of opportunity for potential franchisees wanting to get involved in a fun and family-friendly concept. By their nature, trampoline parks are a great way to engage children in physical activity and burn off excess energy. Kids are going to bounce off the walls anyway, why not let them do it in somebody else’s house? It’s what has made trampoline parks so appealing to moms and dads. “Parents are looking for ways to get kids out of the house, off their iPads and interacting with other kids,” says Michael Browning Jr., CEO of Urban Air Adventure Park. But although jumping is a great outlet for kids, trampoline parks have traditionally been less exciting for parents. Most companies charge adults full price, even though they spend most of the session on the sidelines. What’s more, guests must pay by the hour – leading some parents to feel like they have to jump alongside their children to get their money’s worth. Exhausting mom is usually not a great path to repeat business. For parents, visiting a trampoline park can feel more like an obligation than a family activity and they are less inclined to return in the near future. Like its competitors, Urban Air used to sell passes by the hour. Once their prepaid time was up, a family either had to re-up or leave. Over time, Urban Air realized its returning guests were buying shorter packages, meaning less revenue. So in 2017 it decided to make a fundamental change to its business model and stopped selling time and started selling bundles of individual attractions. With the new model, the guests’ last interaction with staff isn’t them getting kicked out. It’s led to happier customers and more frequent visits. The average stay is now three to four hours, about double what is was before. Further, parents can enter free of charge and have to pay only $5 in most markets to participate. “It’s just a better experience,” Browning says. The first Urban Air opened in Southlake, Texas, a Dallas suburb, in 2011. The location was family-owned and initially there were no plans to turn it into a franchise business. However, after expanding to three parks in the Dallas market, Urban Air began to see a demand for franchising. Parents would bring their children to the park during school breaks and found themselves impressed with the operation. Soon, they began asking how they could open up their own Urban Air. The company has grown exponentially to 131 franchise and seven affiliate locations in the five years since it began franchising. “We’re signing somewhere between five and seven leases and franchise agreements per month,” Browning says. From mid-June to the end of 2018 alone, Urban Air expects to open another 55 locations. That rapid growth is fueled by Urban Air’s wide array of attractions. It’s more than trampolines. The company has elevated itself beyond jumping into a true full-service adventure park. Urban Air’s list of the base attractions that every facility must have includes an indoor roller coaster, ropes course, climbing walls, adventure hub, warrior obstacle course and, naturally, trampolines. However, it also offers a suite of optional attractions including bumper cars, go-karts, laser tag, bowling, battle beams and even a zip-line-like sky rider that allows guests to fly through the building. The company’s newest attraction explores an indoor skydiving tunnel. It allows guests to feel the sensation of free-fall without needing to drop from 13,000 feet above the ground. The skydiving attraction was created in-house by Urban Air’s own engineering team and required a substantial R&D investment. Browning says the cost was worthwhile because it will position Urban Air to dominate the adventure park market. More attractions ultimately means more revenue and happier guests. “That has created the atmosphere where the customer sees the value in diversification,” Browning says. 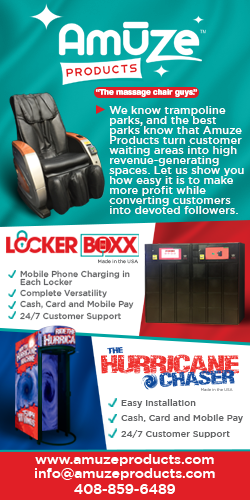 The flexibility Urban Air gives franchisees to select attractions allows for a wider range of potential locations. Facilities range in size from 21,000 square feet to as large as 80,000 square feet, though most fall between 30,000 and 40,000 square feet. Most locations are built inside existing buildings to help expedite growth. In many cases, the company moves into large vacated retail space previously occupied by anchor tenants such as H. H. Gregg or Gander Mountain. The recent announcement that Toys ‘R’ Us would be closing all of its stores provides another opportunity for expansion. “We’re able to move into existing real estate of various sizes and fashion them to our specially designed model,” Browning says. As Urban Air expands its nationwide footprint, the company needs franchisees that share its values for family entertainment. When evaluating potential franchisees, it prefers owners who have a passion for people and hard work rather than someone who wants to open multiple locations but only cares about the bottom line. “At Urban Air, you don’t buy a job. You’re buying an enterprise,” he continues. Although it wants its franchisees to think like entrepreneurs, Urban Air doesn’t expect them to know how to run every aspect of the business from the outset. The company conducts an extensive training program where new owners spend time learning at its corporate office and are then moved to the affiliate locations in Dallas, where they receive hands-on training for various positions. The company even helps with startup expenses. The average initial investment is $2.1 million to build out a facility, but Urban Air offers franchisees financing for 80 percent of the cost. On the operations side, Urban Air manages a full vendor directory and negotiates contracts on behalf of its franchisees to create cost savings. “Our job is always to be getting the best-in-class of whatever it is and negotiate prices for our franchisees that they couldn’t get themselves if they were a one-off mom-and-pop location,” Browning says. Once the corporate team leaves, owners will still have access to Urban Air University, an extensive online training portal. “We’re always there for them 24/7, 365,” he adds. Franchisees must share that level of commitment to growing their own business. Urban Air provides extensive marketing support, but the most effective promotion happens on the local level. Owners must integrate themselves into their communities and attend festival and events to promote Urban Air. Urban Air’s corporate team understands everything it takes to run because they are invested in the business themselves. The seven affiliate locations in the company’s network are owned and operated by its executives. Because its leaders manage locations themselves, they are better equipped to provide guidance and problem-solving support to franchisees. “We believe in what we are selling. Retail behavior has changed and people are spending more money than ever on experiences. We see this macro-trend growing making the reward even greater,” Browning says.